The award recipients are honoured for the development of the theory of Separation Logic, which includes the key notion of separating conjunction, the work showing its applicability in the analysis of non-trivial programs, and the tool development that culminated in Facebook Infer. A Primer on Separation Logic (and Automatic Program Verification and Analysis). The annual general assembly of the EATCS was held at ICALP 2016 on Thursday, 14 July, from 16:30 till 18:15. The slides I used for the meeting are here, for those who are interested. I started the general assembly by apologizing to the audience for the problems we had in making the official LIPIcs proceedings available by the conference date. (A preliminary version of the proceedings was available in the form of three large files, one per track, but those were very large and hard to download at the conference hotel. The EATCS Secretary prepared a dedicated web page from which the files of the individual papers could be accessed, but this page was available too late.) This ICALP was the first edition of the conference with LIPIcs proceedings and there were some associated teething problems. (ICALP is the largest conference ever to publish its proceedings with LIPIcs, as far as I know.) I am responsible for this problem and promised that it won't happen again. I thanked Thore and asked the audience to help the proceedings chair and the LIPIcs staff by sticking to the typesetting instructions they are given. With electronic proceedings, one or two pages more don't matter and there is no point in trying to gain them by hacking the style files or using fonts that are forbidden by the publisher. As a counterpoint, Mikkel Thorup and Yuval Rabani stated that they felt authors should not be bothered by strict typesetting guidelines, and that they should spend their time doing good science rather than having to worry about typesetting guidelines from the publishers. Mikkel stated that "if it typesets, it should be good enough". He also suggested that a nice web interface to which authors could upload their papers for checking whether they meet the guidelines of the publisher would be very helpful. I thanked all the contributors to the discussion. The EATCS will take all the suggestions into account and discuss them with LIPIcs. ICALP will also try to cooperate with other conferences and LIPIcs in order to develop some automated support that can help in preparing the proceedings efficiently and professionally. I then remembered four colleagues who have left us too early: Hartmuth Ehrig, Zoltán Ésik, David Johnson and Helmut Veith. Obituaries for all these colleagues, apart from Zoltán Ésik, may be found in the June issue of the Bulletin of the EATCS. I trust that contributions honouring the memory of Zoltán Ésik will appear in the October issue of the Bulletin. The EATCS Council decided to offer a small donation to the award in memory of Helmut Veith, established by the University of Vienna to support promising students. As usual, I invite the members of the TCS community to honour the memory of the aforementioned colleagues by building on their work and disseminating it amongst our students. Tiziana Calamoneri delivered the report from the conference organizers. (Tiziana's slides are here.) ICALP 2016 had 239 registered participants, 205 of whom registered by the early registration deadline. In her presentation, Tiziana also analyzed some of the reasons for the lack of workshops at this year's edition of ICALP. The committee identified around 50 borderline papers, and we had to choose among them 5 or 6 papers. (For those familiar with EasyChair - most papers with scores 2, 1, 1 were rejected.) Choosing those 5-6 papers out of 50 or 51 papers took up about half of the discussion time, because it was indeed a difficult choice. We felt that almost all of the borderline papers could have ended up in the program. The final choice was made, in part, by assessing the “added value” to already chosen papers. For 2 of the 6 slots we ended up voting between 2-3 alternatives for each slot (papers in the same area that were thought to be of about the same quality). Aside from these few last papers, we devoted almost no attention to balancing subareas of theory. Papers were accepted based on pure merit, as judged by experts. Despite the indifference to areas, I think the program came out rather balanced between algorithms and complexity theory, with a nice presence in specialized niche areas. This is a natural outcome of a diverse committee. Congratulations to the authors of the award-receiving papers! Germany) for Track C. Three invited speakers have already been confirmed: Mikolaj Bojanczyk (Warsaw, Poland), Monika Henzinger (Vienna, Austria) and Mikkel Thorup (DIKU, Denmark). A fourth invited speaker will be announced soon. Mikolaj mentioned that four workshops have already agreed to co-locate with ICALP 2017. If you are interested in organizing a workshop at ICALP 2017, please contact the local organizers. Jiří Sgall presented a bid to host ICALP 2018, the 45th ICALP, in Prague in the period July 9-13, 2018. The slides for Jiři's presentation are here. The bid from Prague was accepted by the General Assembly. Thanks to Jiří and his colleagues for their kind offer to host ICALP in the beautiful city of Prague! ICALP 2017 and 2018 will also allow us to celebrate the excellent contributions of the Polish and Czech research communities to TCS and discrete mathematics. Does ICALP cover TCS sufficiently broadly? What do you think of the current acceptance rates at ICALP? What would you like to see at ICALP that we don’t do? There were interesting suggestions from several colleagues. In particular, there was a lively discussion related to the role of the current incarnation of Track C. Despite the best efforts of the PC chairs of the last few years to "brand" this track as a "theory of networking" track, it is fair to say that, despite the high quality of the contributed papers, Track C is still being seen by many as a less competitive version of Track A. This opinion was, for instance, aired by Mikkel Thorup. In particular, Mikkel asked: "What is the role of the current Track C rather than allowing PC members for Track A to submit to the conference?" I reminded the audience that Track C was meant to cover "emerging areas" and that its scope should therefore be regularly considered. During the ensuing discussion, Paul Spirakis suggested that perhaps Track C could be solely devoted to Algorithmic Game Theory. Summing up, the EATCS Council will examine the future of Track C of ICALP in its coming meetings. Mikkel Thorup also suggested that the submitted versions of the accepted ICALP papers should be posted on the conference web page as soon as they are accepted. This suggestion led to further interesting discussions. IMHO, it would certainly be beneficial to post the final versions of the accepted papers on the conference web site as soon as they arrive. Thore Husfeldt suggested that the EATCS establish an SC for the conference, possibly independent of the council, and that the EATCS consider establishing a "fast track" for the publication of journal versions of the best ICALP papers. Regarding the first point, I informed the audience that the EATCS already has an ICALP Liaison Committee, but that it would be a good idea to give more power and responsibilities to it. That committee should also revise the current version of the guidelines for ICALP organizers, which are definitely out of date in the light of the new publication outlet for the proceedings and the new awards sponsored by the EATCS. I also informed the audience that the EATCS Council has been discussing the possible establishment of an open-access ournal of the association for some time. Regarding awards, the audience suggested that the EATCS consider establishing an ICALP Test-of-Time Award. A young researcher even suggested that ICALP should have a best reviewer award. I thank the attendees for their many suggestions and invite any reader of this post to send theirs to the president of the EATCS or as comments to this post. You are the life and blood of the association. Your input is always most welcome and the EATCS listens to you. We are here to serve. Next the secretary and the treasurer of the EATCS delivered their annual reports. (The financial report is here and the report from the secretary is here.) We also thanked Dirk Janssens who left his post as treasurer of the EATCS after 27 years of sterling service to the association. We welcomed Jean-Francois Raskin as the new treasurer of the EATCS. The rest of the general assembly was devoted to a report from the outgoing president (viz. me). I refer you to the slides for my presentation and to the EATCS Annual Report for the details. Here I will limit myself to saying that at the general assembly I announced the new leadership of our association for the coming two-year term. The new president of the EATCS will be Paul Spirakis (University of Liverpool and U. Patras). He will be supported by Leslie Ann Goldberg (University of Oxford), Antonin Kucera (Masaryk University) and Giuseppe Persiano (University of Salerno) as vice-presidents. During the general assembly, Paul gave a short speech describing some if his objectives as president of the EATCS for the coming two years. The EATCS is in very good hands and I look forward to seeing its influence grow under its new leadership. What should the EATCS do for the TCS community? What activities should the EATCS support (financially or otherwise)? How can we make EATCS membership more attractive (especially among the younger generations)? Any input you might have will be useful for the new leadership of the EATCS. Make your voice heard, so that the EATCS can serve the TCS community even better than it is already doing. I thank all of you for the support I have received over the last four years in my role of president of the EATCS. It was a lot of work (to achieve probably very little), but I learned much from many of you. Thank you! You are the life and blood of the EATCS. 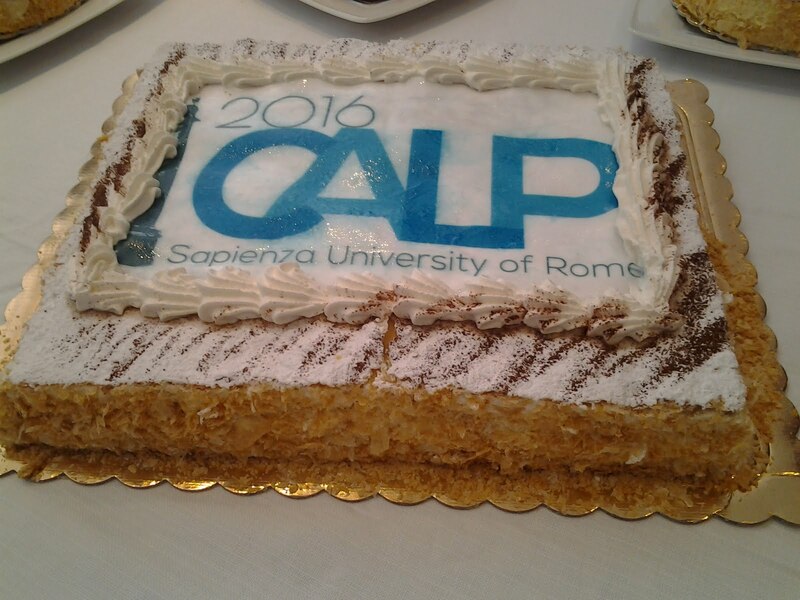 ICALP 2016 took place last week in Rome from the 12th till the 15th of July. The conference, which brought ICALP to Italy for the fifth time, was well organized by Tiziana Calamoneri, Irene Finocchi, Nicola Galesi and Daniele Gorla, whom I thank for the effort they put into making ICALP 2016 a memorable event. ICALP 2016 featured four invited talks, which were delivered by Devavrat Shah (MIT, USA), Xavier Leroy (INRIA, France), Seffi Naor (Technion, Israel) and Marta Z. Kwiatkowska (Oxford, UK), as well presentations by the recipients of the Presburger Award, the Gödel Prize and the EATCS Award. Devavrat Shah kicked off the conference on Monday, 12 July, by delivering a talk entitled Computing Choice. In his talk, Devavrat discussed algorithmic results relating to ranking, rank aggregation and personalized rankings associating intensity to rankings based on partial information resulting from a sparse set of comparisons. The talk, which was excellently paced and interesting, presented many results and I invite you to check Dev's work for the details.This work addresses computational challenges for decision making without a choice model, and offered a glimpse of the exciting possibilities for inter-disciplinary work across disciplines such as CS, EE, OR and Economics. Xavier Leroy delivered the second invited talk, entitled Formally verifying a compiler: What does it mean exactly?, on Wednesday, 13 July. In his talk, Xavier discussed the context for, and the results of, the CompCert project, which investigates the formal verification of realistic compilers usable for critical embedded software. Such verified compilers come with a mathematical, machine-checked proof that the generated executable code behaves exactly as prescribed by the semantics of the source program. In this project, Coq is used both as a proof assistant and as a programming language. Did we prove it (the compiler) right? Did we prove the right thing? In particular, Xavier discussed the latter question in detail and argued that the social consensus underlying the acceptance of proofs in mathematics also plays a role in accepting proofs of software correctness. He also mentioned the "unreasonable effectiveness of labelled transition systems" in semantics and in supporting such correctness proofs. Seffi Naor's talk took place on Thursday, 14 July, and was entitled Maximatization of submodular functions: Recent progress. Seffi stepped in at the last moment for Subhash Khot, who was unable to make the trip to Rome. On behalf of the EATCS and of the TCS community as a whole, I thank him for delivering an excellent talk at such a short notice. Research on the topic of Seffi's talk started in the 1950s-1960s and is now thriving. It has applications in the study of social welfare, economics/game theory, combinatorial optimization, machine learning and information theory. In his talk, Seffi first surveyed results on unconstrained maximization of non-monotone functions, with focus on approximation algorithms, and then presented results for the constrained maximization problem. I refer the readers to Seffi's papers and to this Wikipedia page for more information. The last invited talk at ICALP 2016 was delivered by Marta Z. Kwiatkowska on Friday, 15 July. Marta's talk was entitled Model Checking and Strategy Synthesis for Stochastic Games: From Theory to Practice and is accompanied by a paper that is available here. Marta stated right at the start that, despite the success that model checking and synthesis techniques have had and are having, we have not found yet the right modelling abstractions for autonomous mobile agents such as robots and autonomous vehicles. Software for these vehicles is expected to behave reliably under uncertainty, and its analysis and synthesis require quantitative approaches to specification and verification. As Marta argued cogently in her talk, a game-theoretic point of view is fruitful in the study of such systems. Indeed, games of various kinds have played a fundamental role in the study of the synthesis of correct programs from specifications from the very beginning, and papers on game-theoretic models abound in Volume B conferences. (See the slides for this talk by Moshe Vardi for historical remarks and an overview of the game-theoretic approach to synthesis.) Rather than attempting to summarize Marta's talk, I strongly encourage you to read her accompanying paper, which beautifully summarizes her work on this topic and contains pointers to related literature. The core of the scientific programme consisted of the papers that were selected for presentation by the PC chairs (Michael Mitzenmacher, Yuval Rabani and Davide Sangiorgi) and their PCs. Because of EATCS commitments, I could not attend as many talks as I would have liked, but all those I did manage to listen to were excellent both scientifically and from the point of view of the quality of the presentation. (For one of the talks, I even had to wear 3D glasses :-)) Thanks to the PC chairs and their PCs for doing a truly great job! The award ceremony was held on Wednesday, 13 July, and saw the presentation of the EATCS Distinguished Dissertation Awards, of the Presburger Award to Young Scientists, of the Gödel Prize and of the EATCS Award. The event was a festive occasion and celebrated some of the outstanding members of the TCS community. Radu Curticapean, The Simple, Little and Slow Things Count: On Parameterized Counting Complexity. Thesis work carried out at the Department of Computer Science at Saarland University, Saarbrücken, Germany. Supervisor: Markus Bläser. Georg Zetzsche. Monoids as storage mechanisms. Thesis work carried out at the Department: of Computer Science at University of Kaiserslautern. Supervisor: Roland Meyer. The award committee received an impressive set of submissions in terms of quality. The three selected theses are outstanding. The Presburger Award was presented to Mark Braverman (Princeton University, USA). The Gödel Prize went to Stephen Brookes and Peter O'Hearn for their invention of concurrent separation logic, and the EATCS Award was given to Dexter Kozen. The presentation of each of these three awards was accompanied by an excellent talk by the award recipient(s). As I mentioned during the award ceremony, this might very well be the first time that the Gödel Prize is mentioned in a piece in the New Yorker. The award session was extremely well attended and preceded a short bus tour in Rome and a social dinner in a popular restaurant in Trastevere. The annual General Assembly of the EATCS took place on Thursday, 14 July. I'll report on it elsewhere. Here I will limit myself to saying that, at the General Assembly, I formally stepped down as president of the EATCS after two terms of service (four years). The new president of the EATCS will be Paul Spirakis (University of Liverpool and U. Patras). He will be supported by Leslie Ann Goldberg (University of Oxford), Antonin Kucera (Masaryk University) and Giuseppe Persiano (University of Salerno) as vice-presidents. At ICALP 2016 in Rome, Dirk Janssens also left his post as treasurer of the EATCS after 27 years of sterling service. Jean-Francois Raskin kindly accepted to serve as the new treasurer of our association. The association is very grateful to the above-mentioned colleagues for their willingness to serve and to Dirk for his outstanding service over such a long time. I know that the EATCS community will support the members of the new leadership in their work, just like they helped me during the last four years. If you were at ICALP in Rome and you have any comment, suggestion or criticism, please post them as comments. I'll make sure that they reach the leadership of the EATCS. We are always working on improving an already very successful conference that does its best to provide a bird's eye view of TCS as a whole. I would like to have some blog coverage for ICALP 2016. If you are attending the conference in Rome and you are interested in guest blogging, drop me a line. Ideally, I would like to have a guest blogger for each of the tracks in the conference. You are, of course, also most welcome to blog about the five invited talks, the award ceremony, the general assembly and any other aspect of the conference. I'll try to write something myself, but the more the merrier!